Since the initial launch of GaN based Solid State Power Amplifiers by Advantech Wireless in early 2010, many uncertainties and unknown issues have been clarified. The satellite communications industry continues to wrestle with the undesirable effects of intentional and unintentional interferences on communication signals. The latest strategies for interference mitigation involve new technologies and tools that satellite operators and their customers can use to deal with these effects. Broadband Satellite Communications... Catching Up With 4G, By Dr. R. Gilmore, Chief Executive Officer, EM Solutions Pty Ltd.
Less than 20 years ago, broadband Internet to the home first became a reality, thanks to the introduction of DSL technologies that enabled twisted copper pair to carry traffic at speeds above 1Mb/sec. Last month, the NBC drama State of Affairs featured a disgruntled former U.S. government agent who hacks into a government satellite system to view video that discloses real-time information about enemy combatants. 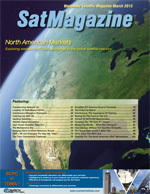 The satellite industry is undergoing a significant transition. Carrier bandwidths are increasing and signals are being placed more closely together than ever before. Most importantly, the technology used to process these signals on the receive side is changing dramatically with the use of digital sampling and Full Band Capture (FBC) techniques. As significant improvements continue to be achieved in high-power amplifier design, many claims are being made regarding the capabilities of each type of amplifier technology used in satellite uplink applications. It is key to understand that our industry needs futureproof solutions to meet the customer expectations: address the increasing OPEX and CAPEX challenges while remaining agile to enable new satellite services in an ever-changing world. In today’s climate of vapid economies and tight budgets, it’s no surprise that consumers are searching for any opportunity to get maximum benefit from the lowest possible investment. Sometimes glibly dismissed as another ruse manufacturers have introduced to get consumers to dip into their pockets again is 4K technology for broadcasting. All Aboard: How SATCOM Can Win The Train Connectivity Challenge, By Doreet Oren, Director of Product Marketing, Gilat Satellite Networks. The latest satellite technology, integrated with one of the oldest mass transportation methods, produces a premium travel experience—and opens an attractive market for ISPs. A SmallSat, Cost Effective Approach To X/Y Antenna Ground Terminals, By Alex Nichols, Technical Director, Ground Systems Group, TeleCommunication Systems Inc.
With the insurgence of the small satellite market the demand for cost effective ground terminals has never been greater. From the 1960s into the 1990s, satellite, microwave and coaxial cables were the hot transmission technologies. Innovators in technology, in business and in content worked miracles in overcoming distance, spreading knowledge and entertainment and creating the biggest mass markets ever known. With recent discussion about the importance of training to reduce errors, and therefore, satellite interference, this theme has become a hot topic for the IRG’s End Users Initiative Advisory Committee. SatBroadcasting™: A Case In Point—ETL Systems + SIS Live... Betting On The Farm In The U.K., selecting ETL Systems, SIS has ensured the efficient delivery of the U.K.’s live news contribution feed along with bespoke television to thousands of betting shops across the country. The baseline—the SIS brand incorporates SIS Betting, one of the world’s leading suppliers of content, programming, facilities and technology to the betting industries, and SIS Live, Europe’s largest satellite uplink supplier, provide broadcast connectivity solutions via satellite and media fiber. Imagine our world pre-IP—hard to imagine— unless you’re in the satellite industry, where ground systems continue to be defined by their analog nature. Restricted by the short distances that RF signals can be routed before they degrade, antennas and signal processing equipment have essentially been shackled together in close proximity—a constraint otherwise not found in the IP-enabled world. That’s limited how ground architecture could evolve to solve issues such as site diversity and centralization. A company’s prosperity and success is measured by wealth. However, is financial acumen the only—or the best—measurement of wealth in today’s business world within a retail chain, in a corporate structure and on Wall Street? (http://www.space-data.org/sda) talked about the Space Data Centre and the organization’s role in managing data for Radio Frequency Interference (RFI) mitigation. SSTL Joins The GEO Club, By Maurizio Vanotti, Head of Telecommunications, Surrey Satellite Technology Ltd.
For some years now, Surrey Satellite Technology Ltd. (SSTL) has been working on a new, small, geostationary platform design, the SSTL GMP-T, under ARTES funding from the European Space Agency. The recent and dramatic drop in commodity prices has brought into stark relief that any manufacturer confined to a single vertical is always at the mercy of that particular market.